Nanami with ink brush and traditional attire. 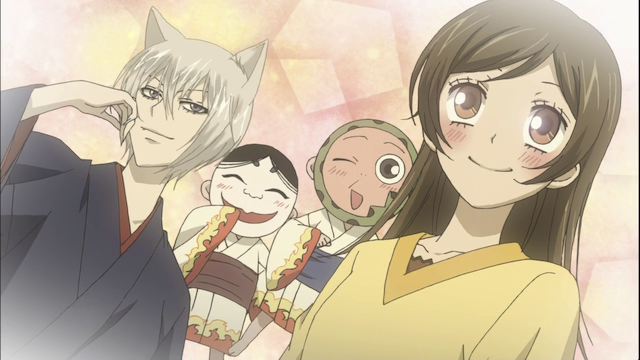 Episode 3 of Kamisama Hajimemashita (AKA Kamisama Kiss) was another cute episode. It also did a good job of introducing slowly developing the storyline between Nanami and Tomoe. One of the things that struck me about this episode, however, was that it doesn’t follow the common anime practice of keeping the characters in a single outfit all of the time. 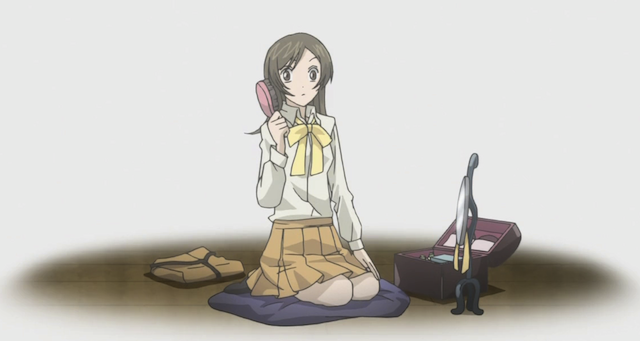 Nanami, in particular, was shown in 5 different outfits, just in this one episode. 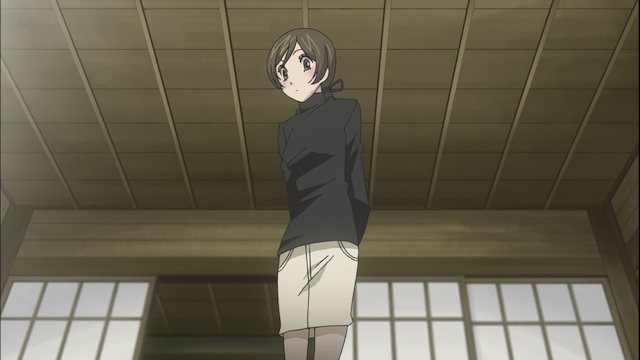 Nanami wearing skirt and black turtleneck. 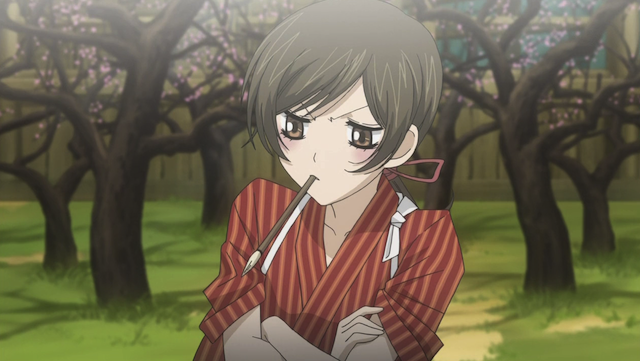 To be clear, my point isn’t that Kamisama Hajimemashita is unique in showing the characters in different outfits. The artwork, however is one of the things that attracted me to this show from the beginning, and I think the fact that the creators made the effort to dress Nanami up in so many different outfits is a sign of the loving care that is being used in making this show. Nanami in her “afternoon in the city” outfit is terrorized by the rowdy kid that knows her from school. Nanami (wearing orange top) and the rest of the temple gang. I think one thing the multiple outfits do is help to give the illusion of elapsed time. This story was meant to have taken place over the course of several days, and seeing Nanami in multiple outfits helps to make that clear. I just started watching this today. What a nice anime. Certainly seems like there are ample opportunities for good screen shots. The second photo in this post is good enough to be a standalone. Anyways good point about the change of clothing. Its a small detail but it does indeed give a sense of time moving forward. Yeah, I like this series. They have done a pretty good job of grounding the supernatural stuff; for example Nanami’s talisman-creating power and Tomoe’s power to change the shape of things (both of which were used in important ways in this episode) had already been demonstrated in an earlier episode. I find the art style quite appealing. 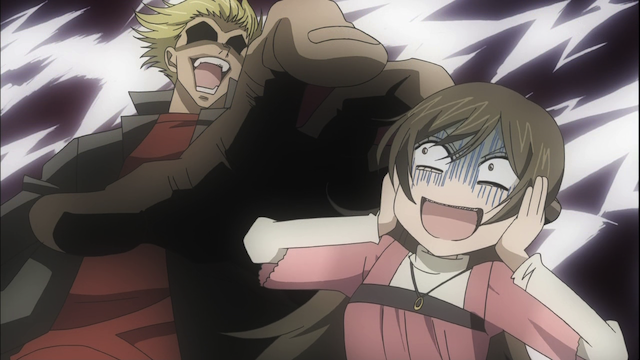 Also the show has the kind of sweetness that makes for a fun watch. I also was very impressed by this episode, for several reasons, the artistic presentation being just one of them. That third screen shot above where she is in the skirt and black turtleneck made me do a double take – she didn’t look like a teenage girl anymore. Actually, the thing I like the most about this show so far is that the story hasn’t spent any time screwing around with Nanami “pushing back” on what fate threw her way. Instead she has embraced her situation and is making the best of it, And best of all she doesn’t appear to be going through any awkward adjustment period. She’s now an Earth Deity, and yet that second picture shows her kneeling on the floor grooming her self in her modestly furnished room. I agree. The show has not bothered with the whole “Waah, why do I have to take on this responsibility” thing. Nanami is very grounded. In the scene where she is kneeling she was surprised about a bird talking to her, but she accepted that she would need to host a catfish youkai in her house without hesitation. The episode started off with her practicing (without success) her powers, and ended with her using them successfully in the service of one of her worshippers. She is also very understanding and forgiving. This is what make me glad. This anime know fashion. I’m tired seeing anime character that only wear uniform or don’t change clothes too often. Nanami’s outfit is simple but cute. Yeah it always seems unrealistic to me when the girls don’t have a variety of outfits.